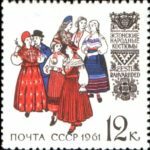 Soviet artist Valery Pimenov (February 15, 1920 – February 28, 2008) – author of historical and revolutionary paintings, portraits, landscapes. 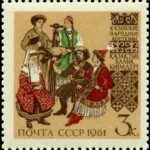 In 1971, Pimenov was awarded the title of Honored Artist of the RSFSR, and in 1994 the title of People’s Artist of Russia. He was a member of the St. Petersburg Union of Artists (before 1992 – the Leningrad branch of the Union of Artists of the RSFSR). 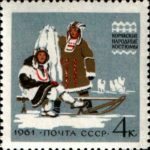 In 1936 he entered the factory of M. Gelts in Leningrad, where he soon became a master-engraver of the highest qualification. Working at the plant, Pimenov studied in art studio of the Palace of Culture of Kirov, which led Brodsky and Kopeykin. Pimenov began to show his work at art exhibitions, and two of them – “Meeting tankers” and “Deeds of Heroes” – exhibited at the All-Union “Defense of the USSR” exhibition (1940). 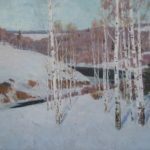 Since 1940, he studied at the preparatory class of Russian Academy of Arts. 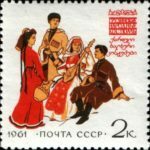 At the end of 1942, together with the Institute he was evacuated to Samarkand, then moved to Zagorsk. During World War II he worked in the defense poster team on the instructions of the Western Front and in the “Windows of TASS” of Moscow. He was able to continue his studying at the institute only after the war, where his teachers were I. Grabar and V.M.Oreshnikov. In 1949 Pimenov graduated from the Academy of Arts. Diploma thesis – painting “Stalin in the rate of the Supreme Command.” After graduation Pimenov continued his studies in graduate school. In 1955, for the painting “Lenin’s words,” he received the academic degree of candidate of art. 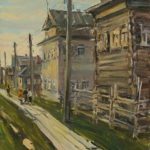 Pimenov manifested himself in the early years, showing interest in historical and revolutionary themes, and, no doubt, the influence of teachers determined the future path of the artist. The same year he was admitted to the Union of Artists. 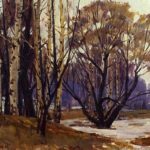 In 1950 Pimenov was enrolled in graduate school of Leningrad Institute of Painting, Sculpture and Architecture of Ilya Repin and began teaching at the same institute, rising later to the post of professor of painting and drawing. 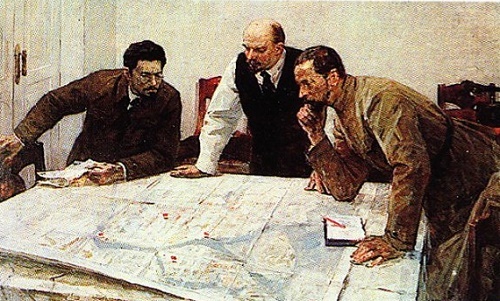 In 1957 Pimenov paints a picture “Workers’ control. 1917”, and in 1963-1965 he is working on the painting “Leninists”. While working on the painting, Pimenov carefully collects the material that helps him to create credible images, among them portraits of the old Bolsheviks – A.A. Bulyshkin and M.E.Yerofeyev surrounded by pioneers. 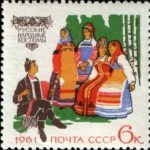 In 1971, Pimenov was awarded the title of Honored Artist of the RSFSR, and in 1994 the title of People’s Artist of Russia. To the development of artistic skills of the artist added numerous trips around the country. He visited North and Central Asia, working on the sketchy material. 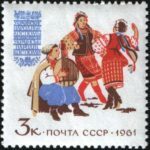 During these years V.Pimenov makes a series of foreign trips, visiting Romania, Bulgaria, Czechoslovakia. Particularly fruitful was the trip in 1965 to Cuba. 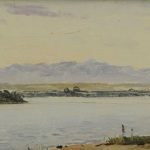 In the sketches brought from the “island of freedom” dominated landscapes with motifs of the Caribbean Sea, the white embankments of Havana, peasant huts and roads, sugar cane plantations. 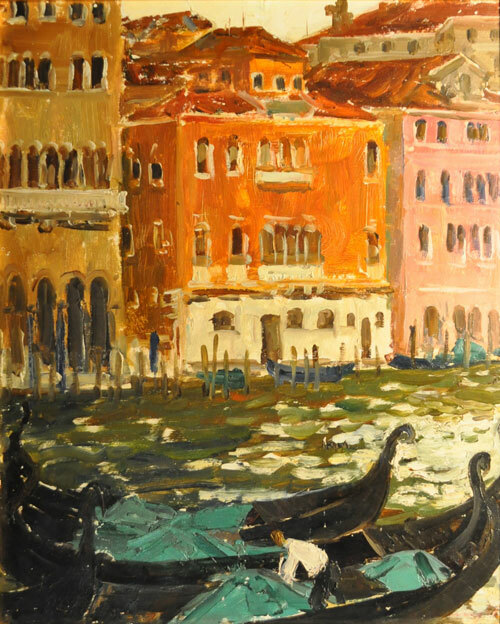 A great influence on the work of Pimenov had a trip to Italy in 1966. 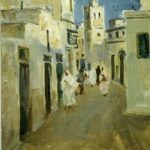 Like many Russian masters, who visited this country, Pimenov discovered the natural beauty of Italy, devoting his landscapes to small and large Italian cities and villages. 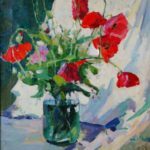 In his works, he uses pure uncomplicated tones, contrasting color combinations. 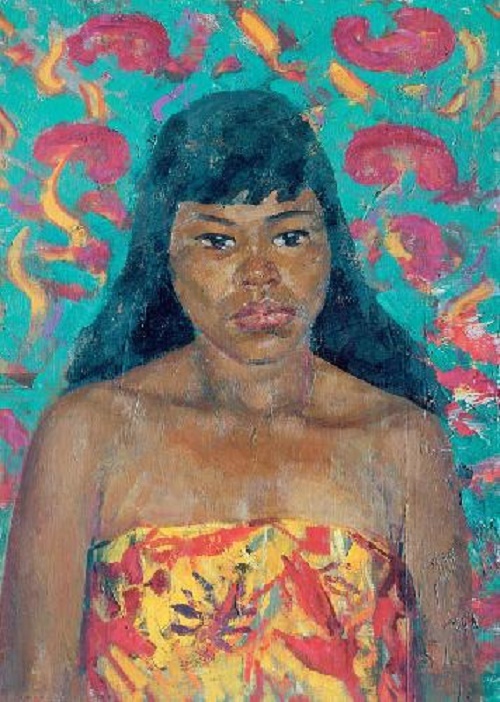 The next three years (1968-1970) V.Pimenov spent in Cambodia, where he was sent by the Ministry of Culture as a professor at Queen’s University of Arts. 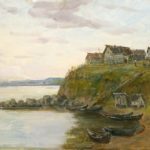 Here he not only worked as a teacher, but also as a landscape painter. Among the Cambodian landscapes stand out cycles devoted to the ancient monuments of Khmer culture and contemporary life of the country. Angkor Temples of X-XIII centuries, Lost in the jungle, are striking in their beauty and special mysterious imagination – “Bayon Temple”, “Entrance to the Bayon”. 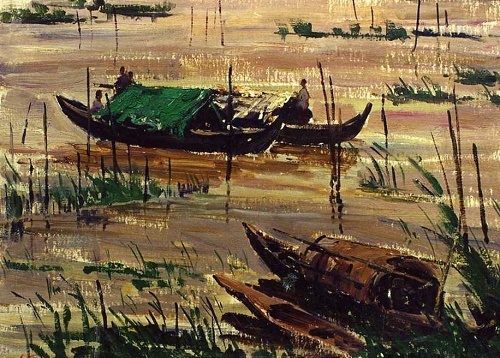 Originality of life and the nature of this country’s artist depicted in the painting “The Vietnamese fishermen” (1969). According to the impressions of his stay in Phnom Penh, he painted one of his best portraits – “Portrait of an Indian teacher” (1969). In 1970-ies he continued trips to Europe. He visited France, Germany, Hungary, the Netherlands. During these years, there are works by the artist, dedicated to Leningrad. 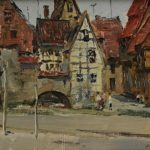 Among them are landscape motifs with famous monuments and portraits of artists – O.F.Berggolts, V.I.Strzhelchik, I.P.Vladimirov. 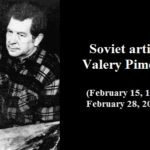 Soviet artist Valery Pimenov died on February 28, 2008 in St. Petersburg at the eighty-ninth year of age. 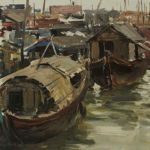 His works are in the Russian Museum in St. Petersburg, in museums and private collections in Russia, France, Italy, Cuba, Vietnam, Cambodia and other countries. 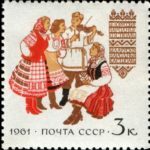 Soviet artist Valery Pimenov participated in the development of plots for ordinary matchbox labels and labels souvenir sets. 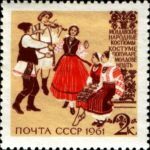 His works included the match set in 1957 “Dancing Peoples of the USSR” (1958), “Physical Culture and Sports” (1959), as well as postage stamps of the USSR. 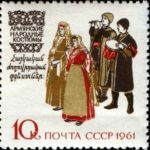 He created a series of postage stamps “Costumes of the peoples of the USSR” in 1961.